Welcome to our nature reserve. You are currently standing by our main gate, which is located to the lower left of the above picture. 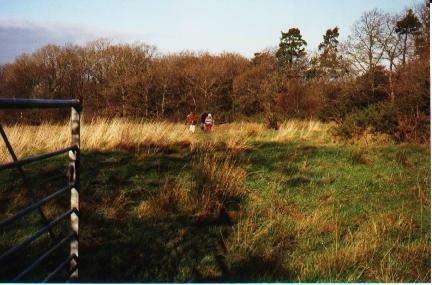 A stroll around Quoditch is a good way to recover from the Christmas lunch, which is what we are doing here in December 1997. This is the first field that you meet up with as you enter through the main gate. To the left of the gate you can see the beech leaves still on the hedge. 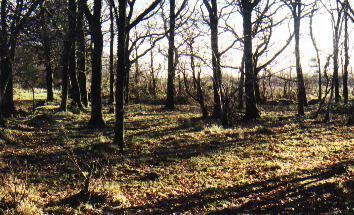 If you look at the hedge just along the lane you can see the deer "racks". 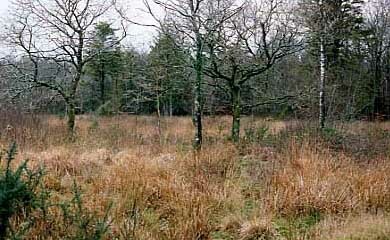 This is where the red deer enter our land on their way through to the plantations. Their tracks run right across the fields. 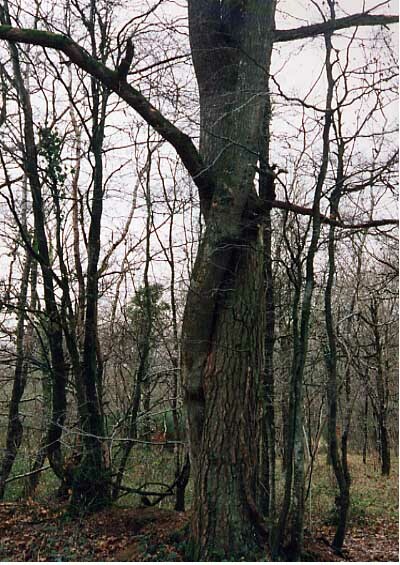 whilst it's lower branches have fungus on them. 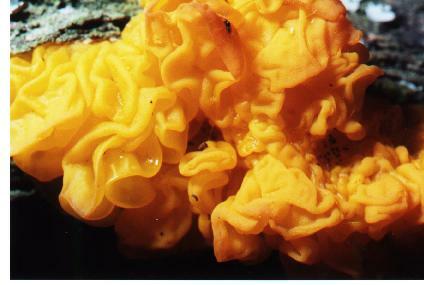 This beautifully coloured one is called Tremella Mesenterica and can be found at various places around Quoditch. With all the recent rain it is not a good idea to walk amongst the reed beds at the moment. Recently, whilst walking there, one of us sank down about two feet into the wet soil. So it's better to follow the field over to the right. There, you will come to a gap that leads to the Ride. The Ride, as you can see from the map, extends the whole length of the estate. It, too, is very slushy at the moment , but if you work your way along the edge you can still get right down to the stream . You can see how the Ride changes on its own page, where we have collected together pictures from the differing months. 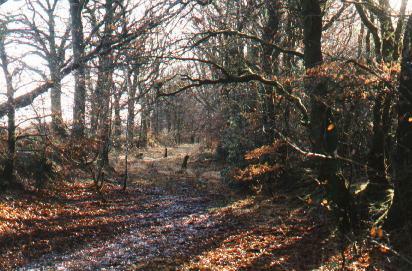 Walk a few yards along the Ride and you will come to our Picnic Woods, which are part of field two. They look quite bleak at this time of the year. In Summer they are cool. light and airy. 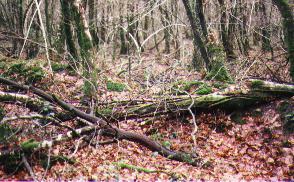 The recent winds have knocked down a few branches here, but they have now been tidied up. In Summer the field is home to our Marsh Fritillary butterflies and to the orchids. But now it's very soggy. It's still home, however, to the deer and the pair of buzzards. The frost has stayed on field three all day. 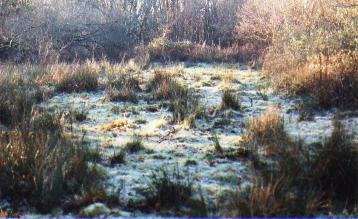 Even by early afternoon what sunlight that has managed to filter through has not been strong enough to clear it away. The frosts allow you to see the structure of the leaves. 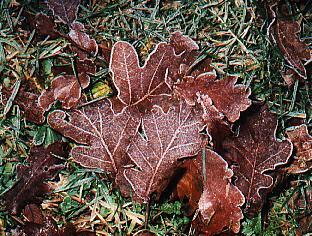 But those frosts are also instrumental in breaking the leaf down. As it freezes, water in the leaf cells expands causing the leaf to break apart. When you are in the west side of this field keep a look out for the pine and the oak just before the entrance to field four that have twisted together. 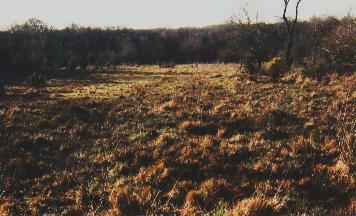 The grasses have grown in this field because it was not grazed in the summer. The farming financial crisis has made it difficult to find a farmer with a few spare cows to graze the land. We'll have to trim it with the brush cutter this time. 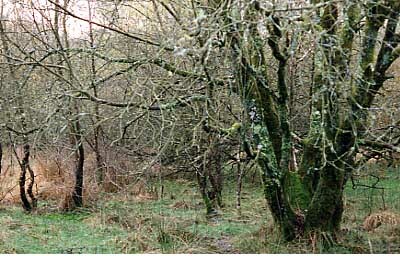 This is part of the woods in field five. The recent high winds have brought down some tree branches. 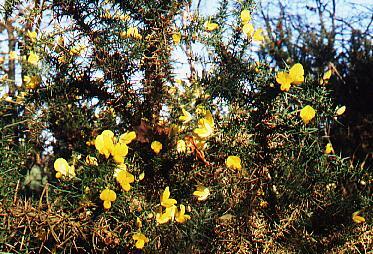 They can be left to rot and provide new homes for the various fungi and minibeasts. We only tidy them up if they are dangerous or obstructing a pathway. In that case, the answer is to saw them up into manageable sizes and use them as path borders to show the correct route. Field six looks much the same at the moment. 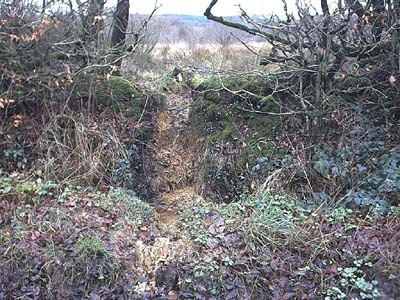 Part of the final field is below the top of the stream bank, so water gets trapped and cannot drain away. It is deeper than the height of our Wellingtons. This is the end of our land. 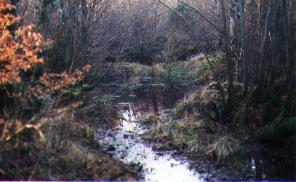 If you cross the stream you are in Forestry Commission land and can walk through the various differing enclosures. If you wish to return to the start of your journey you need to walk back up the Ride.